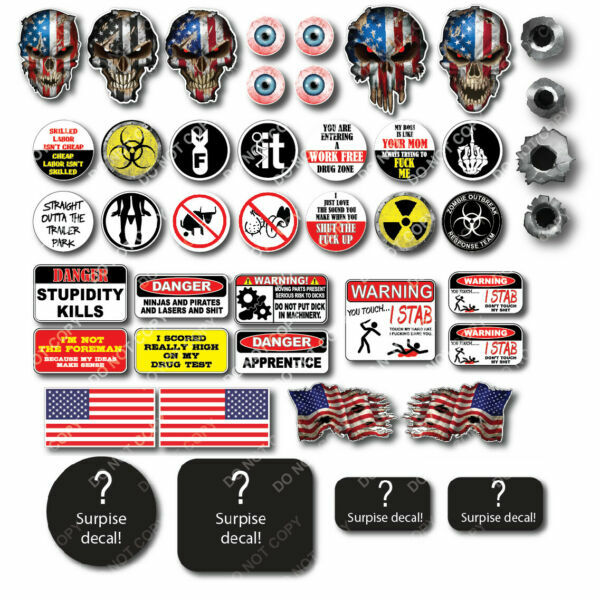 Product Description: You are buying a 29 pack of hilarious hard hat decals!!! They are also great for helmets, coffee cups, laptops, windshields, bumpers, pretty much any clean, smooth surface! Each decal is printed on 3M high quality vinyl using industry leading eco-solvent ink and meticulously cut to shape using state of the art cutting technology. These are sure to get a laugh at work! EACH ORDER INCLUDES EVERYTHING YOU SEE IN THE PIC! The sizes in the picture are not to scale and the sizes will vary from 1.5" up to 2.5". They are sized perfect for your toolbox or hardhat! Shipping: We will generally ship your order within 24 hours of payment, usually even much faster than that! Just look at our feedback! Our customers love our shipping speed! *Decals with FREE shipping will be sent USPS first class without tracking provided but don't worry! We will make sure you receive your decal! Why Us? We produce and sell hundreds and hundreds of decals per week! It's all we do, and we do it FAST! We also strive to deliver the best customer service possible! We take complaints and issues very seriously and work quickly to resolve the issue. SATISFACTION GUARANTEED! We produce and ship from Lewisville, TX right here in the good ol' USA!